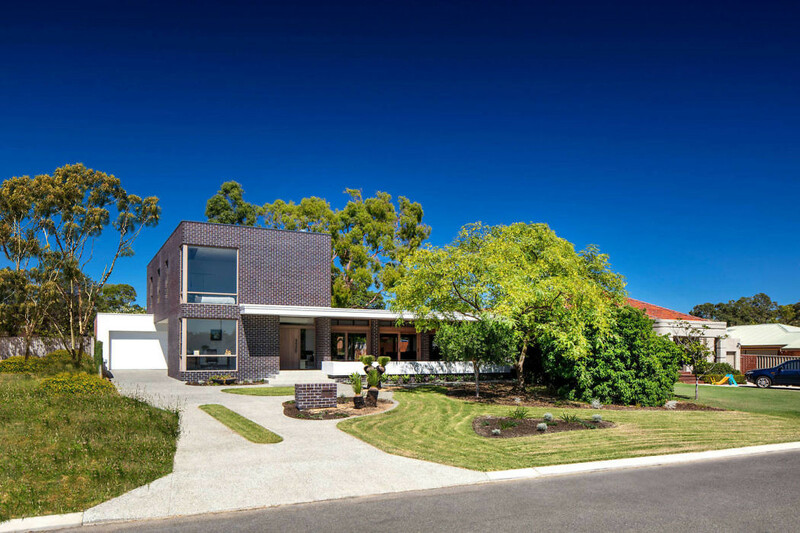 This inspiring single family house designed in 2016 by Mountford Architects is located near to Perth, Australia. The striking geometry of the Cawston Road residence provides a foil for the leafy remnants and mature trees in the original and neighbouring gardens. The distinctive two-story cube has a counterpoint in the strong horizontal lines of the living-dining-kitchen pavilion on its northern side. The linear sweeps of white render and the use of cedar for window frames breaks up and dilutes the severity of the dark brick. Commissioned by the owner as a home for a family of four, the spaces are generous but not lavish. The design provides for privacy, individual activity and family interaction. Employing the concept of shelter around activity, a downstairs media and reading room and a second, modest living area at the top of the stairs retain a visual connection with the communal spaces. The family can open the living-dining-kitchen pavilion to the front terrace and back garden to allow the breezes to flow or withdraw to one of the sheltered spaces with a book or video game and still remain connected to each other and the activity of the household.